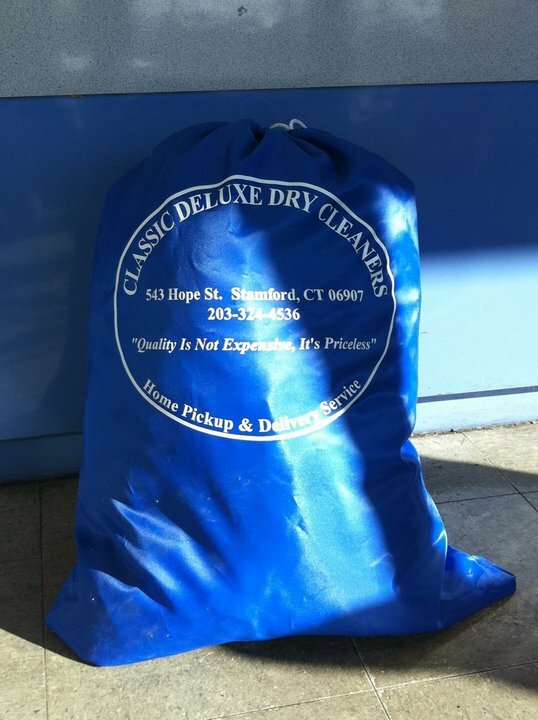 Classic Deluxe Dry Cleaners makes dry cleaning convenient! We are pleased to welcome you to our Home Pick up and Delivery Service. This service is designed to offer you the highest level of quality and convenience for the least amount of time and effort on your part. Place your cleaning in our blue laundry bag provided. Leave your bag at the designated pickup location by 8:00am on your delivery days. Cleaning picked up will be cleaned and pressed and returned on your next delivery day. Tailoring, linens, leathers and specialty items may take longer unless your request otherwise. If we need to hold back an item for re cleaning, pressing, tailoring, we will notify you by attaching a note to your order one what we held back. If you need a garment by a certain day, please let us know either by attaching a note in your bag or calling us. If weather conditions are unsafe for driving, we may not be able to deliver. However, please leave your bag out anyway in case we are able to make the pickup later in the day once road conditions get better. If you have a special request for a certain garment in your order, we ask that you pin a note to the item. If you would like to change a parameter, such as the level of starch for your shirts or whether you want creases or no creases on certain types of pants, please notify us so we can update your account. You will receive an itemized invoice with each delivery. At the end of the month, we will run a billing and charge your credit card on all orders during the month. *We strive to meet and exceed your expectations at all times. If you have any questions, comments or concerns about the service, please let us know promptly so we can address the issue. Let us bring your dry cleaning directly to you! 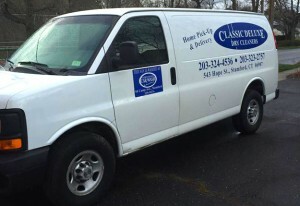 Classic Deluxe Dry Cleaners picks up and delivers dry cleaning from our door to yours in Stamford, Darien, Greenwhich, Darien, New Canaan, and surrounding towns. You don’t even have to be home for deliveries and pick-ups. We’ll provide a laundry bag for your convenience. Simply leave the bag at a self-designated area on your scheduled day of pick-up, and a driver will take it to us for you. Our commitment to gentle, quality cleaning will keep your clothes looking new for years to come. We’ve been delivering your dry cleaning since 1943. Pick-ups are available twice per week on selected days in your area. The turnaround time is 2 to 3 business days and you may choose where you’d like your clothing to be picked up and dropped off at your home (such as garage, side door, or porch). You can pay via monthly billing or automatically via credit or debit card so there is no need to be present at the time of drop off. Schedule a pick-up! Whether you dry clean weekly, monthly, or just once in a while, you can use Classic pick-up and delivery service. Place your cleaning in the blue Classic laundry bag provided to you and leave it at your designated area by 8:00am on your scheduled days. You do not need to be home, convenient!! Become a part of our delivery service and receive 25% off your first month!